For some reason, the guys have been clamoring for strawberry cake for about the past month. They’d never had strawberry cake before in their lives, but I guess the assumption was, we love strawberries and we love cake, so we’ll love strawberry cake. I love strawberries and I love cake, too, but I have to be honest: This recipe is not the long-range solution. I used a white cake mix, and maybe starting with a strawberry might help it some. I’m not optimistic, though. 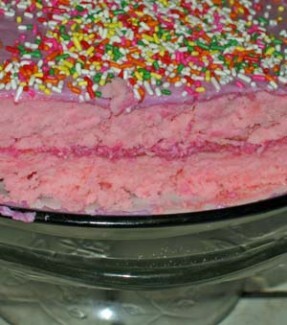 On the other hand, neither am I wild about the go-to strawberry cake recipe my mom has used for as long as I can remember – the one with the Jello mix and way too much oil – so maybe I’m just picky and should stick with strawberry shortcake. This cake turned out really thin, even for an egg-free cake. It didn’t fall – it just didn’t rise very high, only about a half inch. On the positive side, it’s very, very moist. I’m pretty sure it would have fallen apart on me had I not lined the pan with parchment paper. This recipe is based on a Betty Crocker strawberry margarita cake recipe that’s topped with Cool Whip. I used buttercream thinned with DaVinci All Natural strawberry syrup. No, I didn’t mean to use that many sprinkles. I think the overabundance, combined with the fact that I haven’t made cake in a while, combined to win the cake a good review from both guys. 1 1/4 c. club soda – lemon-lime would work just as well, though the lemon flavor would be noticable. 3/4 c. strawberry margarita mix – I used Cuervo because it had less sugar than the other brands at the grocery store where I was shopping. Add margarita mix and club soda to cake mix. Beat on high speed for two minutes. Pour into 13×9 pan coating with Baker’s Joy, lined with parchment paper and then sprayed again. Bake 30 minutes at 350 degrees. Remove from oven and cool 10 minutes before removing from pan.